Take a peek at the exciting things we have been learning about this year! A busy term packed with lots of excitement, visits and events! We started the term with flipping and tossing pancakes in the House competition. Our theme this term has been “All Things Bright and Beautiful” and we have planted potatoes and sowed vegetable seeds ready for planting in the garden later. The seeds have started to germinate and the shoots are showing for our potatoes. We took our cress home to continue growing an d built a greenhouse to protect our seeds next term. During the few warm days in March we had great fun in the garden building a bug hotel, rolling the tyres and making balancing walkways. I n March Sunita visited school and told us all about the Hindu festival of Holi. We all got the chance to dress up and experience Indian dancing. We wore bindis and lots of jangling bracelets. Some of us were even Kings, Queens, Princes and Princesses! Towards the end of term Wrens and Swallows visited Sacrewell Farm near Peterborough. We had a lovely day feeding the farm animals, admiring the peacocks and finding out how the watermill worked to turn the stones and grind the wheat into flour. Later in the term our 4th WOW day with the Oracy Project us took us to Banham Zoo with Tydd St Mary and Fleetwood Lane School for a day looking at larger animals and birds from around the world. We had a busy morning making sandwiches and decorated cakes when we invited our Mums into school for afternoon tea to celebrate Mothering Sunday. Our final visit of the term was to The Cambridge Science Centre with the whole school. Here we learnt about Sound, became engineers designing and making a land yacht to race against each other. Then we explored and investigated the activities. The term ended with our Easter Tea for our Parents where Wrens performed “Plant a little Seed”. We sang and performed with confidence and assurance. Well done everyone! After the Christmas holidays the children came back excited to see their friends and enthusiastic to work and during the term we have been encouraging the children to become more independent and more confident with different sized audiences. We started the term with writing our thank you letters, reading the story of the Jolly Postman and then visited the local Post Office to find out all about their work and how letters are delivered. We bought a stamp, put it on our letter and popped it in the postbox and the postman delivered it back to school the next day! We set up our own post office in the classroom and enjoyed selling stamps and weighing parcels developing our vocabulary and role play. Our theme this term has been “All Creatures Great and Small” and we have learnt about all different types of animals. We’ve sorted, grouped and classified! We’ve been busy labelling, matching parents and child, looking at their different habitats, discovering their needs and finding out how they use for protection. We painted and created collages and modelled clay animals. In January we marked Farmhouse Breakfast week in school and we learnt how to “Shake up our Wake Up” by eating a healthy breakfast and starting the day in the best possible way. We had great fun making flapjacks to serve at Breakfast Club on Oats and Fruit morning. We had great fun on Open Morning with our Parents. We enjoyed showing them what and how we learn in school. We discovered how Chinese New Year is celebrated and then made dancing dragons and lanterns and formed our sentences together. We took part in the RSPB School Birdwatch, we made bird feeders and hung them out in the garden to encourage the birds to visit our garden. We built hides to sp ot the birds with our binoculars and recorded the results on our clipboards! Our activities for “Spreading the Word” this term were based on Traditional Stories. We listened to many different stories, comparing their characters and settings. We learnt how to add dialogue to a picture by using a speech bubble and to our writing by using “said”. We looked at dialogue between characters in plays and finally we used the dialogue by acting out the story of The 3 Little Pigs for our parents as part of our 3rd WOW Day activity. We all tried really hard to remember our words and actions, we spoke confidently and sang all the songs clearly. The EYFS team were very proud of us all. Take a look at what Wrens will be learning about this term! Since half term Wrens have continued to work hard, they have become more independent and confident in school and have enjoyed two visits, lots of activities in school including dressing up days for Halloween, wearing odd socks for Anti bullying week and coming to school in our pyjamas for Children in Need and we even found time to sing and perform for our Parents and friends! This term Wrens have improved their baking skills! 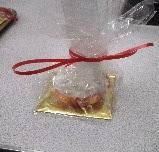 Halloween biscuits, currant buns and Christmas cakes have all been on the menu! We h ave sieved, creamed, beaten and stirred to produce some great tasty treats. The best part was taking them home to share and taste! 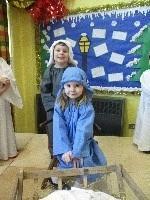 This term our theme was Rhyme Time, we took part in National Nursery Rhyme Week activities and as part of our Oracy Project work we went on another WOW day at Holbeach St Marks Village Hall. 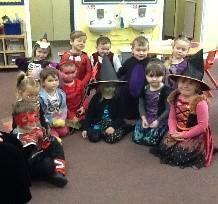 We met our friends again from the first WOW day and shared activities related to Nursery Rhymes. Hump ty Dumpty, boats, salt dough currant buns plus the highlight of the day!– icing and decorating biscuits- were all part of the fun!! After a shared lunch we had the opportunity to perform our Nursery Rhyme on stage for the other schools before heading home. Who knew there were two verses to Humpty Dumpty?! If you go down in the woods today what might you see? Wrens saw horses, dolphins, squirrels and so much more! At the beginning of November, we wore our wellies and hats and scarves and went down in the Woods in Sandringham Estate. We ran in the leaves and watched them twirling in the breeze, we chased each other round the trees and were amazed at the statues we found round each corner- especially the Gruffalo! Towards the end of term we made the EYFS team very proud! We practised really hard, we learnt lots of new son gs and with Swallows we performed “A Magical Christmas Journey” for our parents and families. 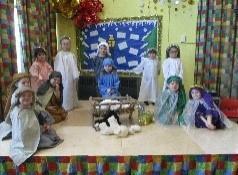 We told the story, became Angels, Shepherds, Kings, Mary and Joseph for two memorable performances. We remembered when to move and when to sing, we were confident and assured. We were “Little Stars”! This September we welcomed 13 excited children to “Big School” to be our Wrens class for 2018-2019. Everyone soon settled and became engrossed in their creative and investigating activities. They all enjoy their daily phonics sessions and have soon become confident at recognising and performing the matching actions and some Foundation children have already started to segment and blend their first words! They all love the outside area , especially the water and the sand pit and within a few weeks you would think they had always been here– they know everything and everyone! This term we have started our Oracy project with other local schools and held our first WOW day. We joined a group of schools at Westmere Primary to take part in activities, watch a Puppet show entitled “The Lost Teddy” and enjoy a Teddy Bears Picnic! We had a lovely time making new friends and learning new vocabulary. Now we are looking forward to seeing everyone again in November! We made our kites in the morning and tried flying them later. Some of us got tangled up but we had a great time and lots of fun. So me of us had never flown a kite before and found it difficult at first but we persevered!! We have read lots of stories about the Harvest this term including The Enormous Turnip and The Little Red Hen. As part of our English work we have written shopping lists and instructions. 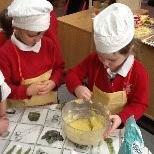 Then we had a busy morning following instructions and making bread. It smelt so good in the classroom and made everyone very hungry! Our first performance for our parents ! We practised hard, learnt all our words and joined in enthusiastically on the day with the songs. We all tried our best and made the EYFS team very proud of us. We were really excited to see our friends from Playgroup. They came to visit us at school with their Mums and Dads. We showed the staff our classroom and all the things we have made and been learning about. They thought we had grown taller and become more confident and had settled in well to our new surroundings. Take a look at what Wrens will be covering this term.